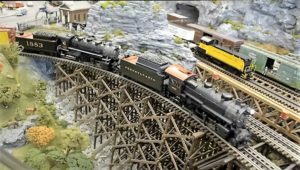 The Red Lion Train Station Model Railroaders are holding an Open House of their 3-rail O Gauge, S and N Gauge, and LEGO model railroad layouts located in the historic Maryland & Pennsylvania Railroad’s Red Lion Train Station at 73 N. Main St. (PA Rt. #24, one block north of center square) Red Lion, PA 17356. We will be raffling off (4) complete ready-to-run train sets including a Thomas & Friends and a Polar Express set. Winners will be drawn New Year’s Eve at 11:00 PM. You need not be present to win. Tickets are $1.00 each or (6) for $5.00.